Bring your friends and enjoy a relaxing evening enameling glass. Choose between a wine glass, a bottle, or two different kinds of vases to paint any way you want–polka dots, a sunset beach scene, flowers, etc! There will be a painting instructor on hand to help guide you through the creative process. 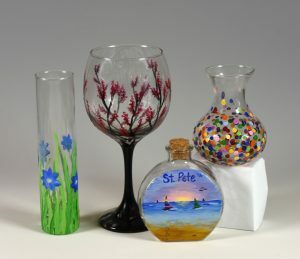 After you finish painting, take home your glass and bake in the oven to cure the paint. Top shelf dishwasher safe.